Although new data continued to show strength in the U.S. economy, markets stumbled across the globe last week. The S&P 500 lost 0.98%, the Dow dropped 0.04%, and the NASDAQ declined 3.21%. International stocks in the MSCI EAFE struggled, posting a 2.35% loss. 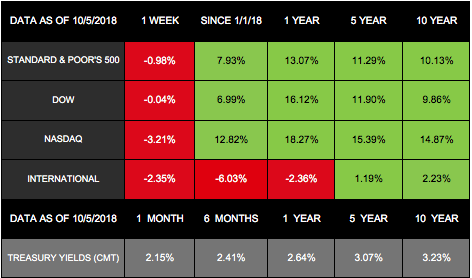 While U.S. and international stocks followed similar paths last week, data is beginning to show that our economic outlooks may be very different for the moment. The latest labor report helped underscore some of the differences between the U.S. economy and the rest of the world. While the data missed the mark for new jobs added, September marked the 96th-straight month of job growth - and the lowest unemployment level since 1969. The report pushed interest rates higher, which contributed to last week's equity losses. However, when describing our economy, Federal Reserve Chair Jerome Powell said it is experiencing "a particularly bright moment." At the same time, the International Monetary Fund (IMF) indicated that it would decrease its global economic growth predictions. The IMF hasn't downgraded its forecasts since 2016. Currently, more risks are beginning to emerge - from trade tension to political challenges in Europe. In particular, the rise in oil prices, the U.S dollar, and interest rates are hurting emerging economies. HSBC mirrored this divide, cutting its global economic outlook while upgrading U.S. numbers. As the labor market tightens, inflation could rise - bringing even more interest rate hikes from the Federal Reserve. While rising rates bring their own set of risks, they are ultimately a sign that the economy is growing. On the other hand, when the Fed lowers rates, they do so because the economy is slowing. This week, we mark the 11th anniversary of the markets hitting their highest pre-recession point on October 9, 2007. At that time, hopes that the Fed would lower rates again contributed to the new record highs. In the ensuing months, the Dow lost more than half its value as the Great Recession began. While markets were down last week, they were still far ahead of their highs from 2007. The Dow closed at 14,164.43 on October 9, 2007 - and ended at 26,447.05 on October 5, 2018. Investors have experienced quite a ride in the past 11 years, but the market's long-term growth is undeniable. Risks are here, as they always are. But we are here to help you understand and navigate those risks, no matter what the markets bring.